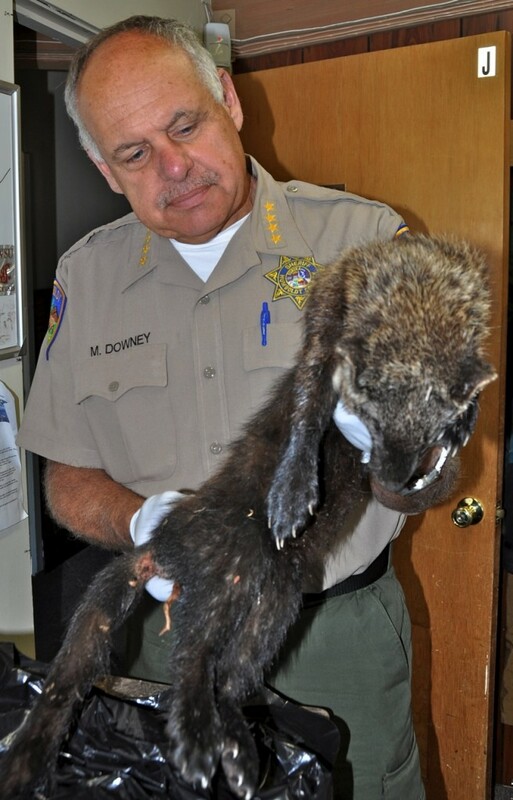 Sheriff Mike Downey with a dead Fisher found at one of the sites. The Fisher is likely to de designated as an Endangered Species in California next year. Officers and the Cannabis Eradication and Reclamation Team (C.E.R.T.) conducted an open field investigation and eradication of a large marijuana cultivation site below the Brushy Mountain Lookout on Friday Ridge, Willow Creek. Three civilian scientific researchers with a background in wildlife, toxicology and ecology were with the officers when they entered the marijuana site. The officers eradicated 7,521 growing marijuana plants ranging in size from 4’ tall to 6’ tall. a 1/4 to 1/8 teaspoon is enough to kill a 300-400 black bear. 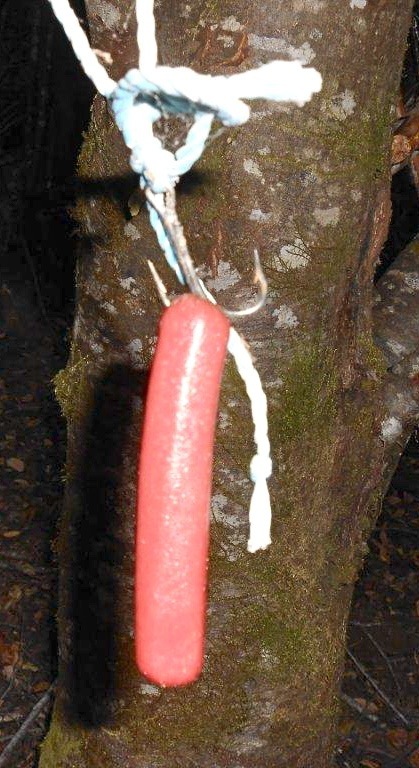 On Wednesday, July 31 at approximately 7 a.m., Humboldt County Sheriff’s Deputies, USFS Agents, H.V.T.P. Officers and C.E.R.T. Officers conducted a marijuana investigation and eradication at another cultivation site located in the Supply Creek Watershed on the Hoopa Valley Indian Reservation. The three researchers again accompanied the officers. The officers located and eradicated 8,473 growing marijuana plants ranging in size from 3’ to 6’ tall. 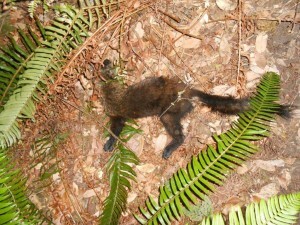 Agents also found a recently deceased Fisher in the garden site. Fishers are currently under review by the State and Federal Government to be listed as an endangered species. The officers and researchers again found environmental damage to the area. 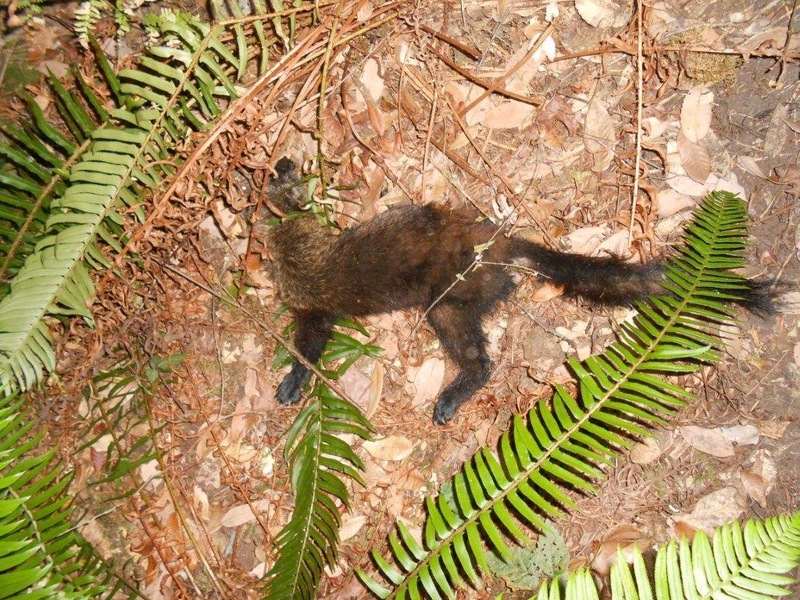 The researchers took custody of the deceased Fisher and intend to conduct a necropsy on it to determine the exact cause of death. There was no obvious signs as to what killed it. On Thursday, Aug. 1 at approximately 9 a.m. the same team listed above with the researchers went to a third marijuana cultivation site located at Le-Terron Flat, Orleans , which is USFS property. The officers located and eradicated 376 growing marijuana plants ranging in size from 3’ to 4’ tall. A total of 1,942 lbs of dry fertilizer, 58 lbs. of liquid concentrate fertilizer, 17 pounds of second generation anticoagulant rodenticide bait were removed in total from the three sites. The rodenticide by itself had the potential to kill 2,753 wood rats, 14 fishers and five spotted owls, said the researchers. Many of these toxicants were near creeks. This entry was posted on Thursday, August 1st, 2013 at 4:05 pm	and is filed under News, Business, Environment. You can follow any responses to this entry through the RSS 2.0 feed.